Robert P. Griffin was born on November 6, 1923, in Detroit, Michigan. He attended public schools in Garden City and Dearborn. He received his A.B. and B.S. from Central Michigan University in 1947, and in that same year he married Marjorie Jean Anderson on May 10. In 1950, he received his J.D. from the University of Michigan Law School. Griffin died April 16, 2015. Griffin served in the United States Army from 1943 until 1946. 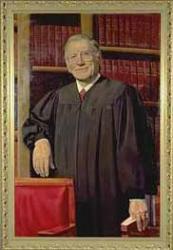 He began his professional career working as a law clerk for Michigan Supreme Court Justice John Dethmers. With Dethmers’ assistance, Griffin found a place in a Traverse City law firm and began practicing law. He practiced from 1950 until 1956 when he was elected to the United States House of Representatives. Griffin was continuously re-elected to that office until 1966, when he was appointed to the United States Senate by Governor George Romney. Griffin was then elected to the Senate in 1966 and was re-elected in 1972. Griffin was the first chairman of the Board of Trustees of the Gerald R. Ford Foundation.